Many people won't have heard of the Indian artist Bhupen Khakhar — we admit we hadn't before this exhibition. The Tate is seeking to remedy his relative obscurity with the first major retrospective of his work since his death in 2003. Khakhar's style is bold and vibrant, and though it appears rather simplistic at first glance, it's loaded with darker undercurrents. There's also a nice mix between Indian and Western styles, showing both native and non-native influences on Khakhar's work. A pastel landscape is disrupted by weaponry, a gory diptych shows a man's guts spilling out after being shot and another's head bleeds so profusely it's as if the painting itself is shedding blood. Khakhar's homosexuality is explored in both tender and more ominous works — a reference to the discomfiture associated with being gay in India. 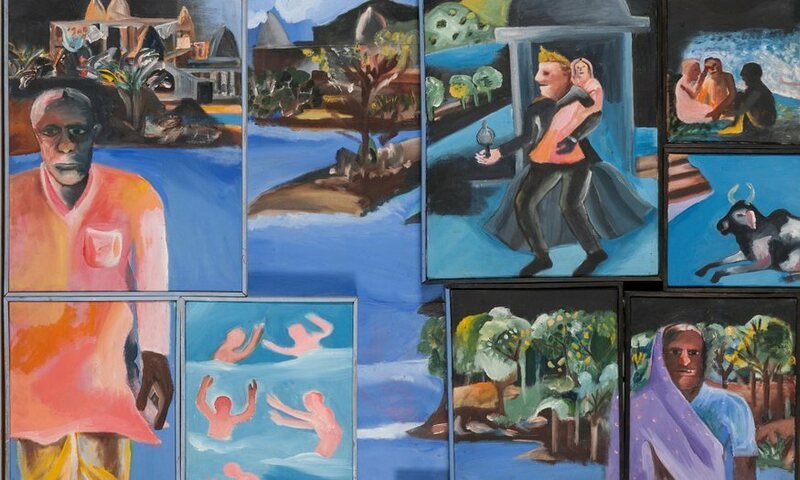 The paintings themselves are visually pleasing, but it's the personal touches and references to Khakhar's own experiences which elevates his work. Bhupen Khakhar: You Can't Please All is on at Tate Modern until 6 November. Tickets are £12 for adults. Visitors can also check out two more exhibitions at Tate Modern. The large scale works of Mona Hatoum and the performance art themed Performing for the Camera.